Log Operating, Recipe and Breakdown Data. Efficient production and quality assurance in core making require continuous monitoring of all operating data. With this in mind, the Lüber GmbH developed an operating data logging («BDE») facility, which makes it possible to log and visualise all consumption data involved in core making. If suitably networked, the BDE will also allow you to retrieve data from your office. Features of our Operating Data Logging Facility. 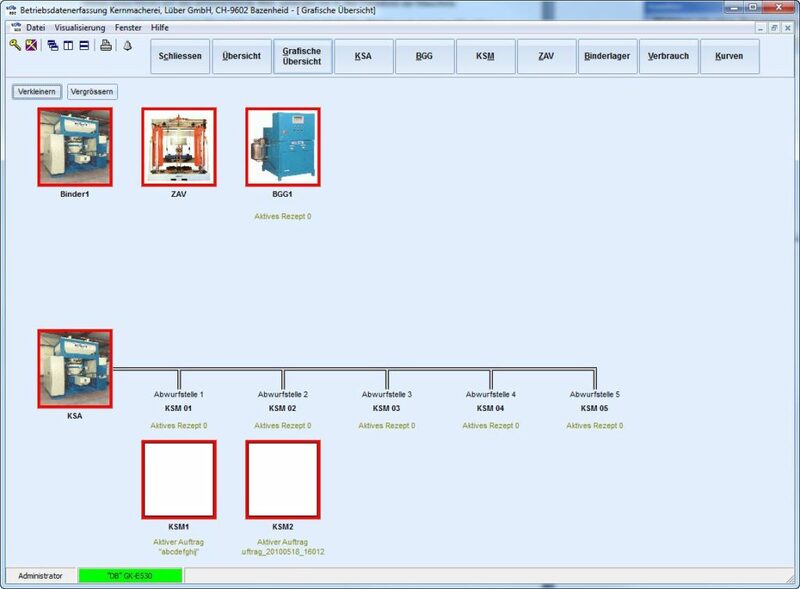 The Lüber GmbH software solution offers a large variety of features. 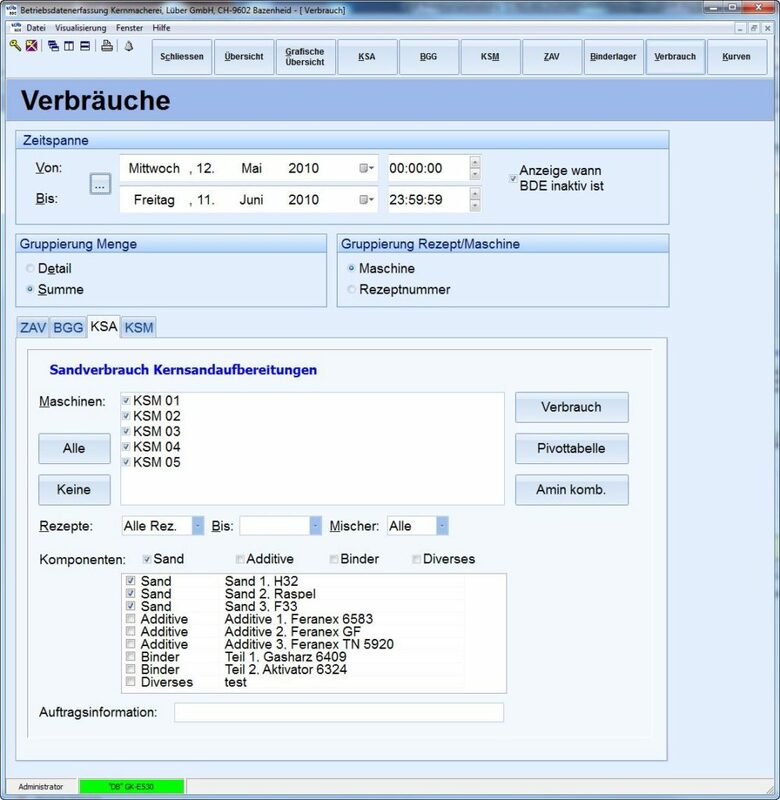 These include order administration, recipe administration, maintaining a recipe logbook to log and register any changes in recipe, consumption data logging with regard to sand, binder, additive and amine consumption and production data output in accordance with current parameters, cycle times, quantities, core breakage and breakdown notifications. Not only can you trace back all recipe changes from your recipe log book file, but you can also print this out. 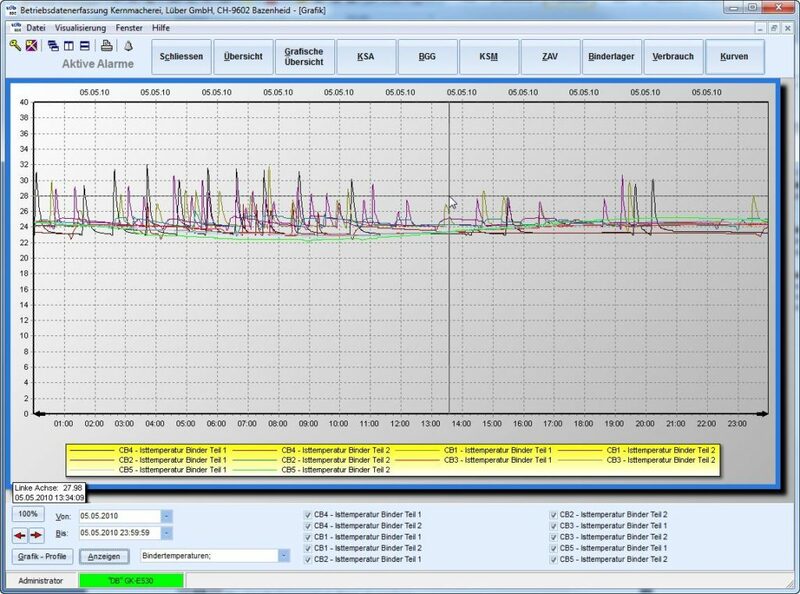 The BDE also logs the temperature history of all connected installations and shows these in graphs. The items shown are the operating state of the installations and devices as well as current alarm, breakdown and operational notifications. The BDE also offers a cost breakdown, where the rates entered for each individual component are analysed and displayed. 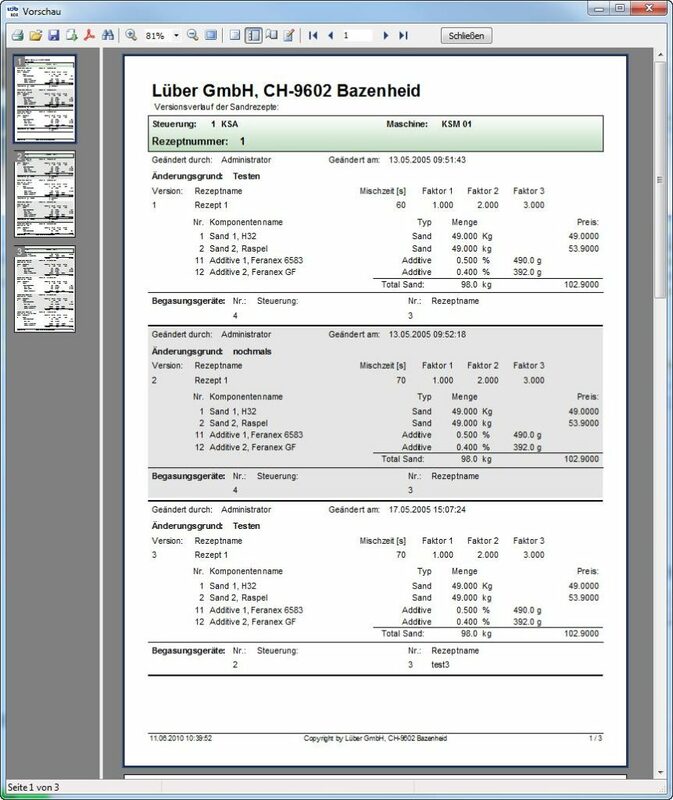 You can also calculate the effective costs of a certain mix or an analysed quantity, with the option to retrieve, filter and individually print out the required data by core sand preparation plant, core shooter, gas generator and central amine or binder supply. Further Features of our Operating Data Logging Facility. 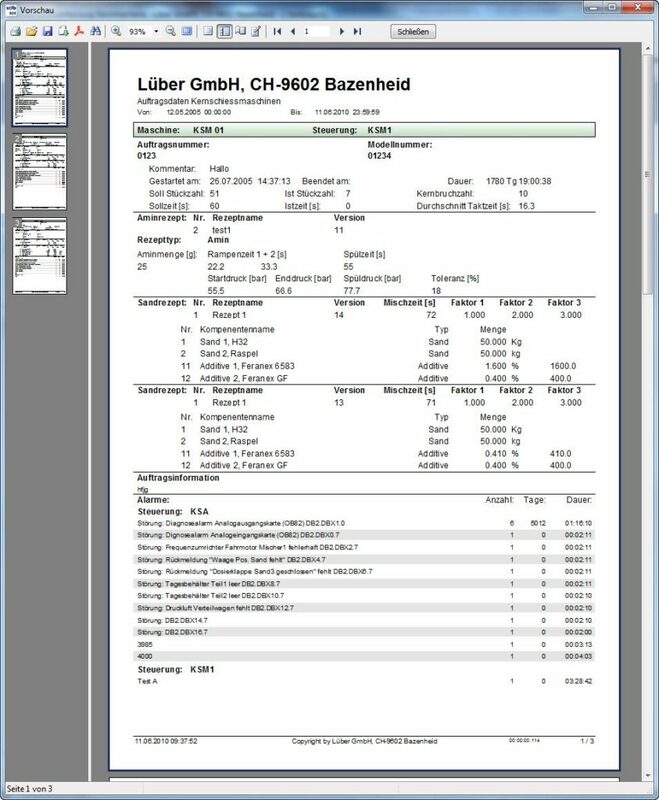 The Lüber GmbH operating data system communicates via an OPC server independently from the controls and is server-client enabled. This means that you can retrieve data from any PC connected to the same network. Software is individually adapted to each customer by one of our commissioning assistants. Access rights can be set individually for every user and/or computer as required, and a back-up is created daily. Our BDE is available in German, English and Spanish language.